Asturias is a region in Northern Spain that was once an independent kingdom. This name was applied also to a part of Albeniz’s Spanish Suite which was originally written for the piano but was more often played on the guitar already in the composer’s lifetime. Albeniz held Francisco Tarrega’s transcriptions in such high regard that he said he preferred them to the piano version. In fact the composer named the piece Leyenda and it was only after his death that a publisher renamed it. 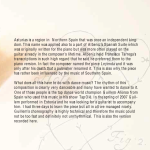 This is also why the piece has rather been influenced by the music of Southern Spain. What does all this have to do with dance music? The rhythm of this composition is clearly very danceable and many have wanted to dance to it. One of those people is the tap dance world champion Guillem Alonso from Spain who used this music in his show TapOlé. 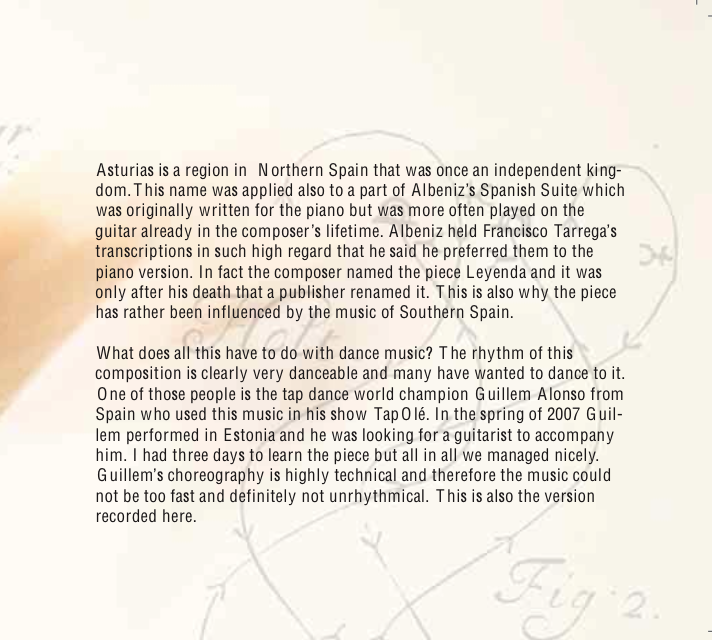 In the spring of 2007 Guillem performed in Estonia and he was looking for a guitarist to accompany him. I had three days to learn the piece but all in all we managed nicely. Guillem’s choreography is highly technical and therefore the music could not be too fast and definitely not unrhythmical. This is also the version recorded here.